PHOTOS, PHOTOS AND MORE PHOTOS! Please send yours in so we may POST & SHARE THEM! 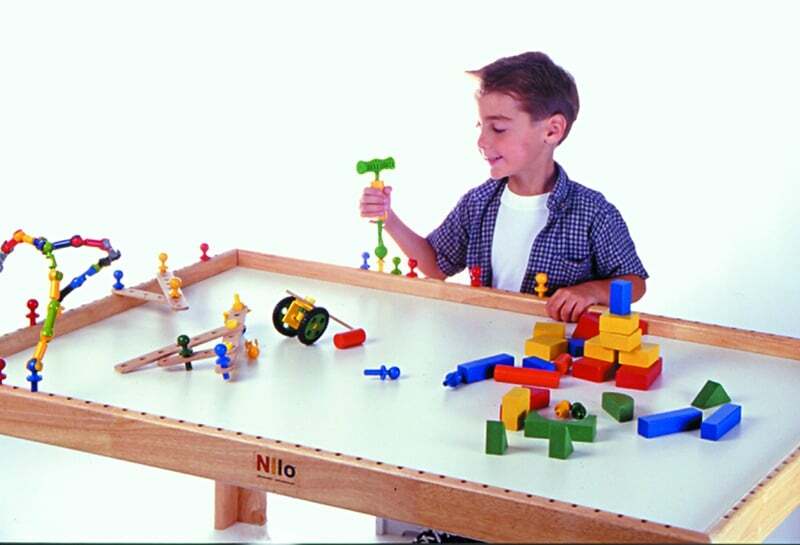 We humbly request our customers to feel free to send us snap shots of their children playing with their Nilo table and products! We would love to upload them to our web site for other interested parents to view! 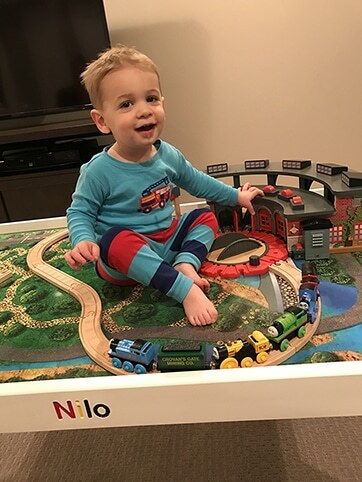 We would not divulge your personal information, we’d just post your photos and say something like,”Janice from Texas posted this photo of her two year old Cole playing with his train set!” By constantly uploading photos of our table and products in different settings…bedroom, living room, playroom, etc., everyone will be able to get a good feeling about the look… and use of our products. Needless to say, it will be incredible to see your amazing children on our site having super fun, too! Also, please make a REVIEW on our website once you’ve made a purchase and have had a chance to check them out, use them. REVIEWS are VERY IMPORTANT..they truly help customers decide whether or not to make a purchase! The more our customers post their sentiments through REVIEWS on our site…the better for all. Thank you for your consideration! Just got this one yesterday 2/6/17. Jonah enjoying life…and from what we heard…mom is too! Thank you so much for sending it in! Below, my son Connor draws on our Theasel. It locks into our table with holes. Circa 2000. Below, my daughter Morgan does the same as above. She’s around 6 here. My youngest son Connor and his cousin Murphy play on our Block Mats which are Lego and Duplo compatible! Connor and Morgan are at play with our Theasel in its puppet theatre use. We no longer produce the chair Connor is sitting on…we found our Stool is the best source of a sitting piece for play at our tables. Morgan sits on our N32 Toy Chest, storage and seating in one. 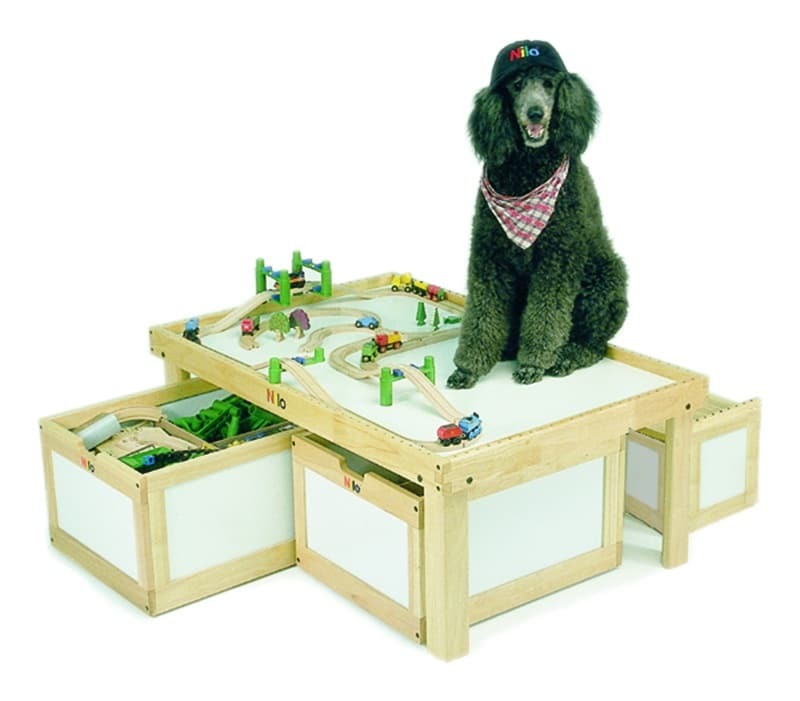 Below, Morgan is about 7 years old and plays with Playmobile on our table along with our play board at the time. 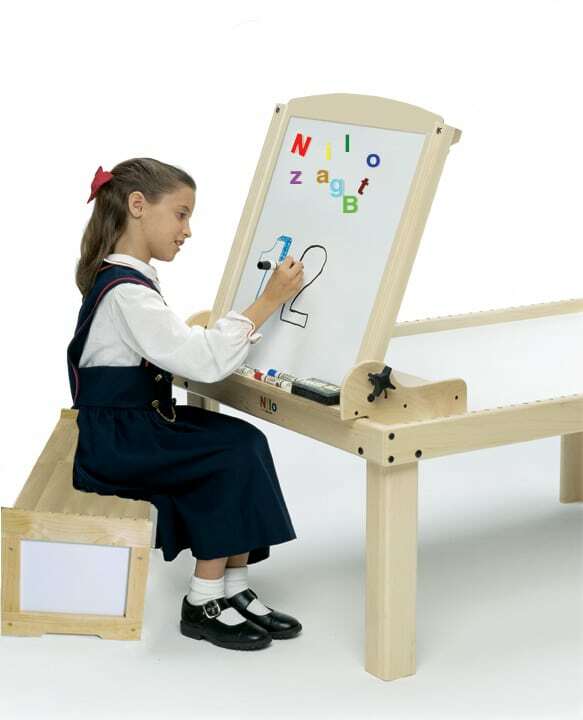 The play board has been long replaces with our FREE N65s Graphic Play Mat with every N51 series table purchase. Connor plays with our N99s Slide Hammer ‘N Nails set, hitting nails into and out of our table with holes. Our N95s Nails have been redesigned now and are totally non-chokeable. You can build Zoobs off of them! It is a great pastime for both girls and boys. In fact, this was Morgan’s favorite thing to do on our table! Hmmmmm, is our table strong enough? Below is a photo shoot we did many years ago. Our three children are Blake, center back; Morgan to his right and Connor in the orange shirt in the front. We got them all to smile! Hard to do, yes! Anyway, thanks to our design our tables are rock solid and will last for generations! 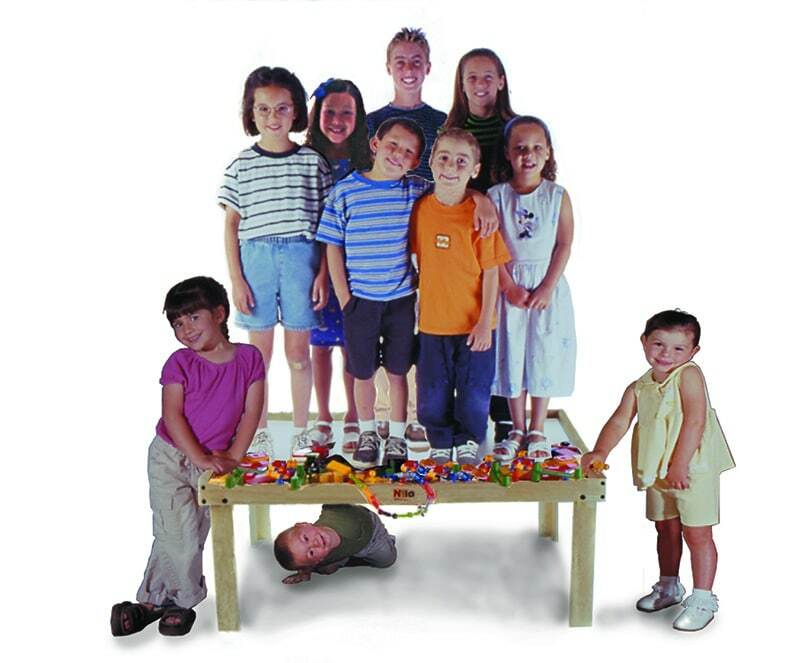 While you can find cheaper tables out there for a little less money….this baby you’ll keep for your grandkids once your children are out of the nest and on their own! Below, the kids are playing with Play-Doh and Puzzles! 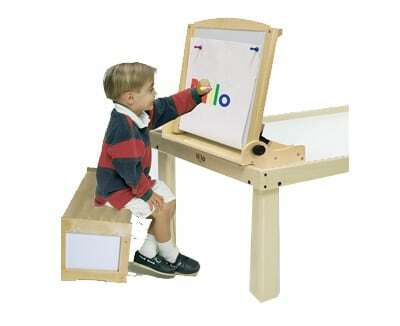 Thanks to our white melamine “easy to clean” table top…it is ideal for many other activities like this! Many tables out there do not have a surface like this, they feature some printed play board or graphic image which does not cut the mustard! Some folks ask if its good for dry erase markers. Its not, however, if you get even permanent marker on the table top you can use Ajax or Comet to carefully get that mark off. Note, you are cutting through the melamine so you should not do this regularly! Below, is our incredible Standard Poodle, Jazz! Ain’t he cool sportin’ his Nilo cap! Seriously, he was more human than he was dog! Very smart, too! Came from a blood line of Grand Champions! He’s in dog heaven now but we’ll never forget him! Notice how 2 Nilo Bins can be under our large N51 table. Also, our N32 Toy Chest is shown in the background. 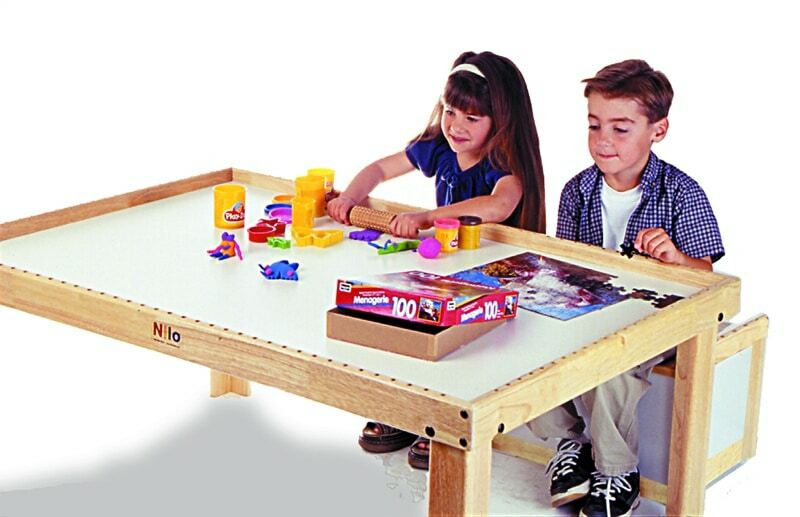 If you have two Bins flush at the front of the table and the Toy Chest up against them under the table, the Toy Chest would stick out about 6″. We have another photo below to show this from the side so you have a better idea. Also, one N26 Nilo Bin can go under our smaller N34 table but it would stick out about 1″ on both front and back. The Bins were designed to go under the N51 large table, not the N34 but you can do it as mentioned. The green Nilo-Jax we have decided to retire. We didn’t sell enough of them to make it worth continuing. 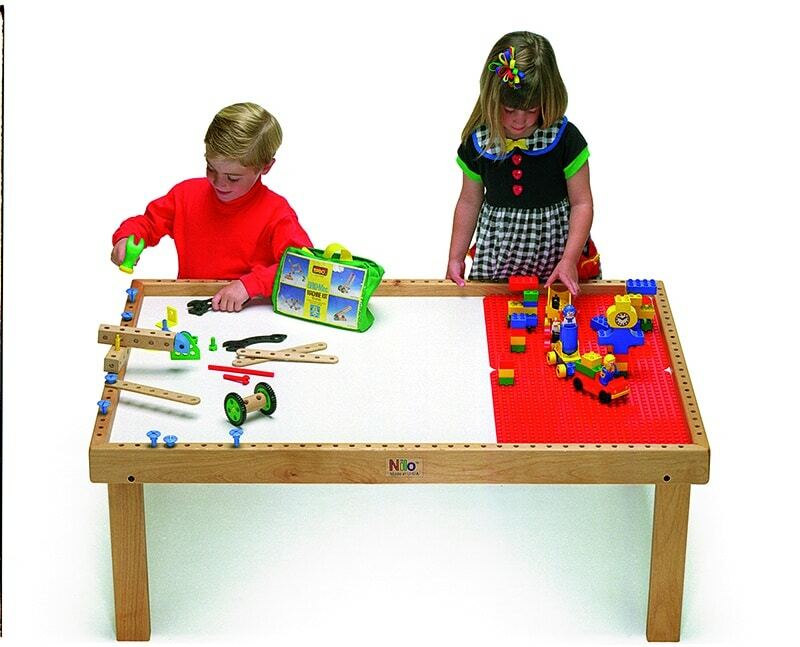 The photo below shows Blake and Morgan playing on our original N48 large table (circa 1994). As such, the red Lego brand Duplo baseplate is shown here. We have since made our larger N51 table and we also have our own baseplates (we call them Block Mats). See them under Accessories on our web site! Brio Mec is also shown, the wooden construction set. Note, we offer our N99 Slide Hammer ‘N Nails and also our N95 Nilo Nails to hit nails into and out of our table framing! Find them under Accessories on our web site.